Volunteers are being encouraged to come forward to help with ‘Ashbys Big Tidy Up’. In association with NWLDC Street Action Team, Ashby Town Council and Keep Britain Tidy ‘Big Tidy Up’ Campaign a litter pick is being organised throughout Ashby by the Ashby Hastings Rotary Club. Youngsters will be able to exchange all the rubbish they collect for gold chocolate coins and other goodies! Volunteers can register their interest in helping by visiting www.eventbrite.co.uk or by calling Brian on 07591 494727 or Paul on 07905 848981. In view of the problems encountered in March last year due to the bad weather, this year’s event has been moved forward to April. Volunteers can start from any of 10 different locations, in each case working their way to the Leisure Centre in Hood Park. Please register early and get your name on the list of your choice. In association with NWLDC Street Action Team, Ashby Town Council and Keep Britain Tidy ‘Big Tidy Up’ Campaign the fifth litter pick is being organised throughout Ashby by the Ashby Hastings Rotary Club. Last time, despite the cold, nearly 100 children and adult volunteers managed to pick up over 100 bags of rubbish in and around Ashby! This year it’s hoped we can exceed that number. Anyone can volunteer to help. No experience is necessary but experienced Litter Pickers are encouraged to act as Team Leaders for less experienced volunteers. Litter picks, bags and safety vests will be provided but volunteers need to wear suitable clothing, sturdy gloves and sturdy footwear. Young people under the age of 16 will need to be accompanied by a responsible adult. A ‘Trash to Treasure’ hunt will take place during the tidy up. Youngsters will be able to exchange the rubbish they collect for a chocolate coin and other goodies. Depending on the number of volunteers available, and with some willingness to be flexible, it’s hoped that most areas in and around Ashby will be picked free of litter. 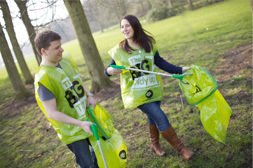 It recruited around 374,000 litter picking volunteers across 1350 organised events. 630,000 bags of rubbish were collected. The Keep Britain Tidy CEO said: “The Great British Spring Clean is an opportunity for the millions of people who care about the environment on their doorstep to do something positive that will make a visible difference. © 2016 Ashby Big Tidy Up. All rights reserved.